In the evening before my parents 45th anniversary we all showed up unexpectedly. We organized a surprise sleep-over at my parents house. It was very unique to be together with all ten siblings. 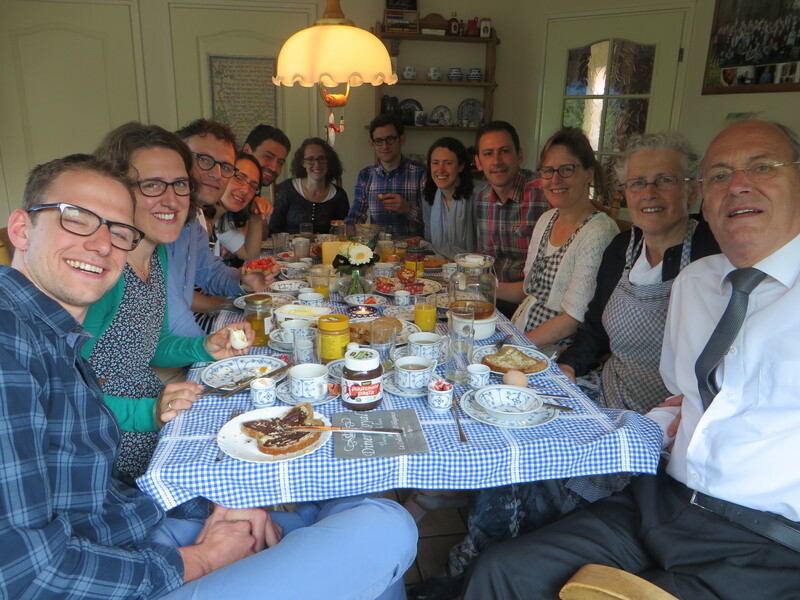 One of the reasons for our visit to the Netherlands was my parents anniversary and to see my brother and his family before they head back to Tanzania, later this week. And what a surprise it was! My mother was speechless, my dad was thinking that we just came for a cup of tea. But we stayed. We had a lovely, very precious time together. Wine by moonlight, sitting in a circle, reading psalm 128 before bedtime. The five brothers went for an evening walk and the five sisters practiced their belly muscles on the corridor floor. We talked till the little hours at night and fell peacefully asleep, realizing that it is very precious that this is possible and that everybody is still alive after all those years. This picture was taken at breakfast, with thanks to sis Rieneke who organized this. Every family has lots of stories, good ones and sad ones. But there are moments when you just think about the good that is here. This moment was one of them. It is just grace that brought us this far. And only grace it will be, that lead us home. What a beautiful picture. Sometimes we have to hold onto just those good, precious memories. It looks like you had a wonderful time. Thanks so much for linking up!